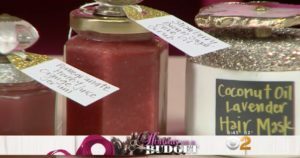 Holiday DIY CBS LA Day – Beauty Gifts Straight From Your Fridge! Beauty treatments from the kitchen. I love my beauty products. When I started to realize that one of the first ingredients on many of my masks and serums was fruit or fruit extracts of course I immediately thought I could make some of these pampering treatments myself–and packaged in a pretty jar they would make the perfect gift. For the first idea on CBS LA, click here to watch the entire live segment the face serum is a combination of pomegranate (an anti oxidant), orange juice (a skin brightener) and honey, to tighten pores. After crushing the pomegranate seeds to gather the juice, mix equal parts of the juices and add enough honey for a slightly dewey texture. 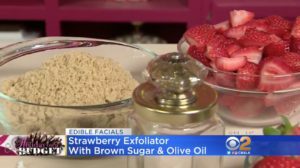 For the facial scrub, I blended a 2:1 mix of strawberries and brown sugar (exfoliating) plus two tablespoons of olive oil (moisturizing). I added extra brown sugar after blending to ensure the texture of brown sugar remained. And for the hair mask, I mixed lavender essential oil into coconut oil. The key to this treatment is to heat the oil–the heat opens up the hair follicle allowing it to absorb the treatment. You can also cover with a shower cap to keep the moisture in. I scooped these mixtures into jars and tubs–each of the containers tops got special treatment too. Using Tacky Glue, I sprayed some of the tops, then sprinkled with gold or silver. once dry, using a hot glue gun I affixed drawer pulls or knobs–some glass, one agate) to the tops for a beautiful handle. Now Inhad gifts to give that were as stunning on the outside as they were useful and pretty on the inside. Today on iheartradio: Dive Into Spring With Fab Hair Masks!